Earn your certification from the Barral Institute - and assure patients your training comes straight from the source – Jean-Pierre Barral, DO, MRO(F), RPT. Techniques Level – CVTP – Certified Visceral Techniques Practitioner. This covers VM1-VM4 and LT1. Visceral Manipulation Level – CVMP – Certified Visceral Manipulation Practitioner. This covers VM5-VM6. Ensures a deep understanding of anatomy, physiology and Visceral Manipulation Therapy techniques. Helps preserve the right of qualified healthcare professionals to practice Visceral Manipulation. Demonstrates your commitment to excellence and enhances your networking and referral status – establishes you as a dedicated professional with the highest standards of excellence. Allows you to use the professional designation "CVTP" or "CVMP" in your title. Successfully complete the following seminars. Successfully complete an at-home objective exam that covers VM1-VM4. Submit five (5) case write-ups following the required format. Case write-ups format, which can also be found in the Frequently Asked Questions. Successfully complete a practical/oral/written exam with a Certified BI Examiner that tests your ability to understand and apply VM techniques from class levels VM1-VM4 and LT1. Register for CVTP (add item CVTP to your shopping cart and complete the purchase), or call BI at 866-522-7725 or 561-868-6898. Successfully complete Techniques Certification Level (CVTP) and the following seminars. Successfully complete an at-home objective exam that covers VM5-VM6. Successfully complete a practical/oral/written exam with a Certified BI Examiner that tests your ability to understand and apply VM techniques from class levels VM5-VM6. Note: Visceral Manipulation Certification includes Techniques Level. Techniques Certification must be successfully completed before sitting for the practical/oral/written exam of the Visceral Manipulation Level, or a person may take the overall Visceral Manipulation (CVMP) practical/oral/written exams at the same time, which cover VM1-VM6. Register for CVMP (add item CVMP to your shopping cart and complete the purchase), or call BI at 866-522-7725 or 561-868-6898. A person is eligible to repeat each seminar they have attended (VM1-6) for $200* each while actively signed up for the corresponding Certification Program (upon space availability). * This is for U.S. and Canada classes only and some city surcharges may apply. Note: Visceral Manipulation Certification through the Barral Institute certifies a person's abilities in Visceral Manipulation (VM). Since certification does not provide a legal right to practice, a person must have the appropriate credential and/or license to practice manual therapy in their locale. Ensures a deep understanding of anatomy, physiology and Neural Manipulation Therapy techniques. 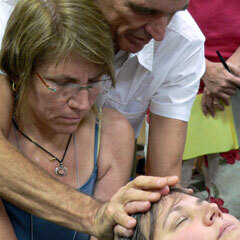 Helps preserve the right of qualified healthcare professionals to practice Neural Manipulation. Allows you to use the professional designation "CNMP" in your title. Register for CNMP (add item CNMP to your shopping cart and complete the purchase), or call BI at 866-522-7725 or 561-868-6898. Successfully complete an at-home objective exam that covers NM1-4. Submit five (5) case write-ups to your examiner at the practical exam, following the required format. Case write-ups format, which can also be found in the Frequently Asked Questions. Successfully complete a practical/oral/written exam with a Certified BI Examiner that tests your ability to understand and apply NM techniques from class levels NM1-4. A person is eligible to repeat each seminar they have attended (NM1-4) for $200* each while actively signed up for the corresponding Certification Program (upon space availability). Note: Neural Manipulation Certification through the Barral Institute certifies a person's abilities in Neural Manipulation (NM). Since certification does not provide a legal right to practice, a person must have the appropriate credential and/or license to practice manual therapy in their locale. Represents the highest credential as it comes from the developer of the modality – Jean-Pierre Barral. Enhances networking visibility - your listing on the Barral Institute website will designate that you are Certified. After the Visceral Techniques Level, you may use the designation, CVTP. After the Visceral Manipulation Level, you may use the designation, CVMP. After the Neural Manipulation Practitioner Level, you may use the designation, CNMP. This includes the at-home written exams for each class level (VM1-VM4), as well as the written/oral/practical exam (VM1-VM4). This includes the at-home written exams for both class levels (VM5-VM6), as well as the written/oral/practical exam (VM5-VM6). This includes the at-home written exams for class levels (NM1-4), as well as the written/oral/practical exam (NM1-4). What if I attended some of the classes in the VM format prior to 2005? Can I still sit for Certification? Yes, you will be given credit for having completed the corresponding class. Many people find it helpful to purchase the current study guides and to repeat classes. There are two levels of VM Certification – Techniques and Visceral Manipulation. The critical difference between the two is that Techniques Level covers VM1-VM4 and the Visceral Manipulation Level additionally covers VM5-VM6. All of the material is provided in the seminars, study guides, as well as the textbooks for each level. A person may repeat (VM1-6, NM1-4) for a substantially reduced rate of $250 USD per class while actively signed up for the corresponding Certification Program (upon space availability). Complete the application and sign up for the applicable Certification Program by registering with BI via phone or on-line and pay the registration fee. You will be e-mailed the at-home written exam(s) corresponding to the levels of classes that you have completed. Once complete, e-mail the exam(s) back to BI. Your test score(s) will be e-mailed to you within 2 weeks. Submit five (5) case write-ups following the required format via e-mail or fax. Once you have passed the written exams and submitted your case write-ups, you are eligible to sit for the written/oral/practical exam for the corresponding Level. What is the required format for the Case Write-ups? If you wish to take your cases a step further, while not required for certification, Barral Institute encourages publication of cases, as it furthers the credibility of this body of work, and makes more therapists aware of the potential of the Barral therapies. ONLY IF you wish to have your case considered for publication, please use our Suggested Case Study Format. If you do not wish to use your cases for anything other than certification, use the format listed above. You will find a listing of Certified BI Examiners at www.barralinstitute.com – Certification Program. Contact an individual Examiner to reserve your examination date and time (this may be one-on-one or in a group setting). How do I reschedule my practical exam? Contact the Certified Examiner. Examiner's cancellation fees are applicable. How many test questions appear are on the written and practical exams? The written exam for each class contains 30-50 questions depending on the class level. The practical exam requires 2-3 techniques from each class level and appropriate oral responses, as well as 10 objective written questions per class level. The test questions are selected to accurately reflect class knowledge and information necessary to effectively treat patients. A passing score on each written and practical test is 80%. What happens if I don't pass the written exam? You may retake the written exam up to 3 times (with a retest fee of $25 each time). After the third time, you will be required to repeat appropriate class levels before retesting. What happens if I don't pass the practical exam? You may retake the practical exam up to 3 times with a retest fee 50% the certification fee for each re-test (CVTP- VM1-4 = $200, CVMP- VM5-6 = $150, CNMP- NM1-4 = $300). After the third time, you will be required to repeat that level class before retesting. Is there a mandatory Recertification at any time? BI requires that each therapist certified in Visceral Manipulation and/or Neural Manipulation through BI certification program complete 24 hours every four years of BI-approved continuing education. This may be in the form of BI courses (participating or assisting). BI reserves the right to revoke certification for actions deemed inappropriate by the certification ethics committee. Send an e-mail to certification@barralinstitute.com containing the concern. There is a $15 fee for a new Certificate. A new certificate will be issued and mailed to you. Be sure to include your updated mailing information. Send an e-mail to certification@barralinstitute.com containing the concern and the correct spelling. A new certificate will be issued and mailed to you. Be sure to include your updated mailing information. Send an e-mail to certification@barralinstitute.com or a letter containing the concern and your new name. There is a $15 fee for a new Certificate. A copy of the marriage/divorce certificate/license must be included with the request (e-mailed, mailed or faxed). A new certificate will be issued and mailed to you. Be sure to include your updated mailing information. Mailing address: Barral Institute, 11211 Prosperity Farms Rd, D325, Palm Beach Gardens, FL 33410. The following people have achieved the highest level of Certification - Barral Institute Diplomate. Diplomate status is granted by Jean-Pierre Barral and Alain Croibier, and includes all Visceral, Neural, Vascular, and Manual Articular levels. Diplomate Certification will be available to all alumni in the future. After successfully completing required courses and take-home objective exams, please contact an Examiner to schedule the practical/written/oral portion of the CVTP(VM1-4), CVMP (VM5-6) exam or CNMP (NM1-4) exam. The pace was excellent - slow enough to facilitate learning, but quick enough to avoid boredom.